SUBHEAD: Centrist Democrats riled as Warren says days of 'Lukewarm' policies are over. She says; "The Democratic Party isn't going back to the days of welfare reform and the crime bill." In a wide-ranging and fiery keynote speech last weekend at the 12th annual Netroots Nation conference in Atlanta, Georgia, Sen. Elizabeth Warren (D-Mass.) relentlessly derided moderate Democratic pundits calling for the party to move "back to the center" and declared that Democrats must unequivocally "fight for progressive solutions to our nation's challenges." As The Hill's Amie Parnes reported on Friday, Warren's assertion during the weekend gathering that progressives are "the heart and soul of today's Democratic Party"—and not merely a "wing"—raised the ire of so-called "moderate" Democrats, who have insisted that progressive policies won't sell in swing states. But recent survey results have consistently shown that policies like single-payer healthcare, progressive taxation, a higher minimum wage, and tuition-free public college are extremely popular among the broader electorate. Sen. Bernie Sanders (I-Vt.)—the most prominent advocate of an ambitious, far-reaching progressive agenda—has consistently polled as the most popular politician in the country. For Warren, these are all indicators that those pining for a rightward shift "back to the center" are deeply mistaken. 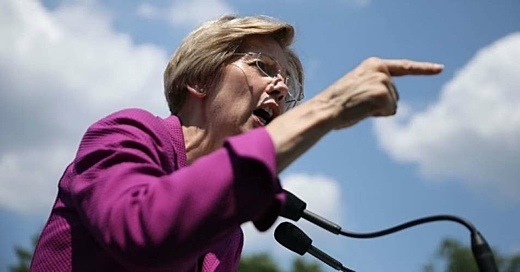 Specifically, Warren took aim at a recent New York Times op-ed by Democratic commentators Mark Penn and Andrew Stein, who argued that Democrats must moderate their positions in order to take back Congress and, ultimately, the presidency. Warren ridiculed this argument as a call for a return to Bill Clinton-era policies that "lock[ed] up non-violent drug offenders and ripp[ed] more holes in our economic safety net." "The Democratic Party isn't going back to the days of welfare reform and the crime bill," Warren said. "We're not going back to the days of being lukewarm on choice. We're not going back to the days when universal healthcare was something Democrats talked about on the campaign trail but were too chicken to fight for after they got elected." "And," Warren concluded, "we're not going back to the days when a Democrat who wanted to run for a seat in Washington first had to grovel on Wall Street." For months media outlets have speculated that Warren is gearing up for a 2020 presidential run, but she has denied the rumors. Warren's remarks came as a large coalition of progressive groups is mobilizing during the congressional recess to pressure Democrats to formally endorse the "People's Platform," a slate of ambitious legislation that includes Rep. John Conyers' (D-Mich.) Medicare for All bill. Video above: Watch Warren's full speech at Netroots Nation. From (https://youtu.be/Rc2D9pn8mjc).